The construction of a new terrace patio-pictured here at the Santa Barbara Botanic Garden last August-has been permanently halted by the Board of Supervisors, which upheld the Historic Landmarks Advisory Commission ruling that the work was impermissible in the meadow area. 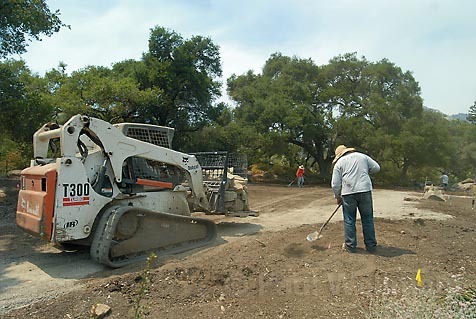 The controversy began about seven months ago, when community members and neighbors of the Santa Barbara Botanic Garden saw construction beginning in the open meadow near the garden’s entrance. Bulldozers and workers were clearing the ground where a 40-foot-tall oak once grew. The 100- to 150-year-old tree had been removed because it was diseased, and in its stead, the garden was growing a terrace, the plans for which included the installation of a 4,025-square-foot area featuring a three-tiered, flagstone-floored exhibition space. The community uproar led to County Planning and Development-which had previously provided a work permit for the project-issuing a stop work order. After questions arose about the changes to the meadow and its status as a historic landmark, the department rescinded the permit and sent the matter to the Historic Landmarks Advisory Commission (HLAC) to determine whether the commission should have approved the project first. According to a 2003 Board of Supervisors resolution, no changes to the landmarked portions of the garden could be made that “substantially deviate from the foregoing historic landscape design concept or historic use of the landmark property unless express consent in writing is first had and obtained” from HLAC, which, in its September 10, 2007 meeting, decided the project did indeed fall under its jurisdiction and, furthermore, that the project was impermissible under the resolution. The garden’s board has since filed multiple appeals and sat before HLAC in multiple hearings. The two groups did achieve a compromise terrace design, but on February 11, the garden withdrew its revised project from HLAC and announced it would move forward with Tuesday’s hearing in front of the Board of Supervisors. The controversy ended-at least temporarily-when the County Board of Supervisors voted 4-1 at the Tuesday, February 19, meeting to confirm HLAC’s decision that the project fell under its jurisdiction and that it was therefore impermissible. In fact, 23 acres of the 63-acre garden-including the meadow-are designated a County Historic Landmark over which HLAC has jurisdiction regarding certain elements and activities. But lawyers for the garden had countered that the garden is exempt in this project because the work is allowed as a change, repair, relocation, or replacement to the area where the oak tree once stood. “We don’t believe the resolution is ambiguous or unclear,” said attorney Rick Battles. “We’re simply making the area more accessible,” Executive Director Ed Schneider said of the area, which is often used by the garden for events, education, and fundraisers. A packed house-almost evenly split between the two sides of the issue-came out to the nearly three-hour hearing. The two sides used strong language in describing either opposition to or support for the project. Some said the garden was working with “selfish insensitivity,” while others called the project “disturbing” and a “massive concrete, steel, and stone structure.” “It’s the legacy of this community. : Once it’s betrayed, it’s gone forever,” said community member Tim Steele. The other side called the terrace a “modest improvement” and said it was part of a system of paved walkways that would enhance the ability of those with disabilities to enjoy the garden. Garden spokesperson Nancy Johnson said after the meeting that the garden’s board was disappointed with the decision. As Johnson stated that they will seriously weigh the garden’s options for the next step, Schneider was overheard telling many people the garden would take the matter to Santa Barbara Superior Court in a lawsuit. According to 3rd District Supervisor Brooks Firestone, the threat of a lawsuit was one of a few factors influencing his no vote on the issue. The other motivation for the no vote, Firestone said, was the small scale of the project. He expressed concern that many people speaking against the terrace project weren’t so much against this project but against change in general. “If landmarks become unreasonable, unworkable, the whole process is brought into disrepute,” he said. During Tuesday’s hearing, supervisors also charged HLAC and the garden with working together to propose revisions to the 2003 landmarking resolution to improve its clarity to avoid confusion in the future.